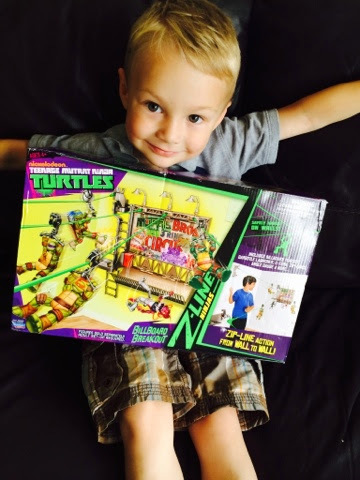 I reviewed a TMNT Z line toy earlier this week and thought I'd share this external competition with my readers for a chance to win some brilliant Go Ape and Turtles toys! The Teenage Mutant Ninja Turtles are Getting Zippy this autumn and are giving 20 lucky winners the chance to win a pair of tickets to a Go Ape of their choice to take part in aJunior Tree Top experience. Ninja fans can participate by heading towww.swapit.co.uk/tmnt to take part in the Getting Zippy experience. Kids simply have to catch the Turtles as they whizz across the screen on their zip lines and take part in the Teenage Mutant Ninja Turtles quiz for their chance to win one of 20 pairs of tickets to a Go Ape experience. The prize of tickets to Go Ape can be taken at any of the 13 locations nationwide at a date to suit the winner. The vouchers will enable the winner plus a friend to take part in a Junior Tree Top experience at the site which includes canopy exploring, trail blazing, obstacles plus negotiating crossings and finishing with an epic wind-in-your-face zip wire! The 20 winners will also receive £50 of Teenage Mutant Ninja Turtles Z-Line goodies including a Deluxe Playset and Figure.10 runners up will also be chosen and will receive £30 offabulous Turtles Z-Line Goodies! To enter into the Getting Zippy competition, fans should head online to www.swapit.co.uk/tmnt before the closing date of 1stSeptember 2014 for a chance to win! Winners will be chosen at random from entries received via print and digital entries and the winners and runners up will be notified one week after the closing date. All winning entries will be announced on Flair’s website on www.flairplc.co.uk from 7th September.